Are you ready for some Christmas polish???? 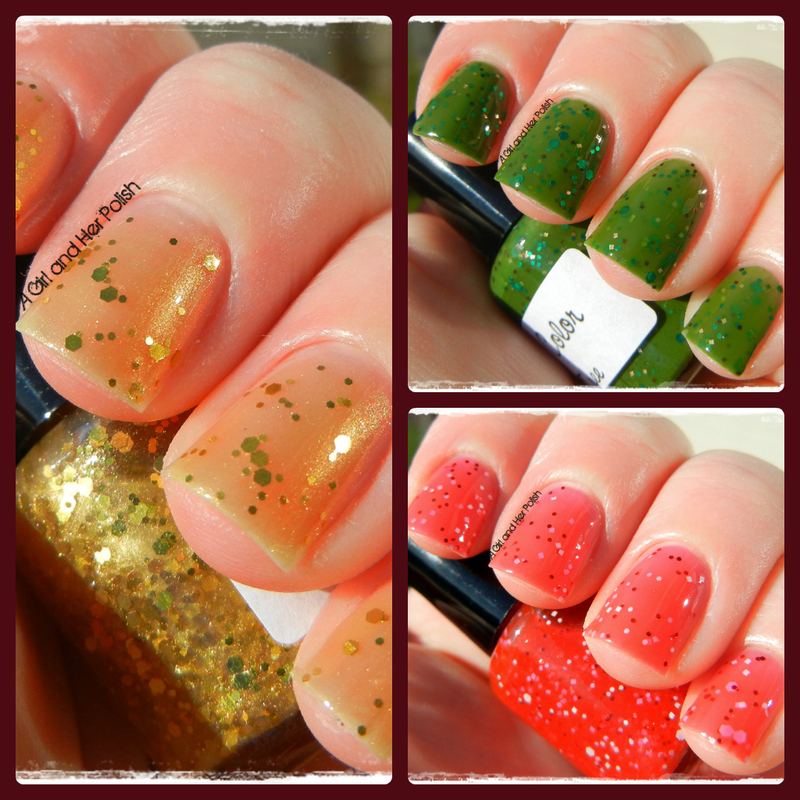 I have my first indie polish Christmas collection to share and it is pretty awesome! The collection comes from the fabulous Sunny at 365 Days of Color. This collection consists of 3 scented polishes! YES, I said scented! Gorgeous shimmery polish. I am not a huge fan of gold polishes but Sunny has created something special. I love the hint of glitter, which of course represents the champagne bubbles. The polish is scented to smell like strawberries and champagne but to me it just smells sweet. It's not an overpowering scent, just light and sweet. Bubbly is a very sheer polish and would work best layered over a base color. I added 3 coats, without a base or top coat. No doubt my favorite polish of the collection! I love the base green that Sunny picked for this polish! It is a dark green jelly that smells strongly of evergreen. Its like having little Christmas trees on your nails! I applied 3 coats with no base coat and 2 coats of HK Girl. I think that the next time I wear this I will add a green base. A yummy red jelly! I LOVE the square glitter in this polish!! The scent is supposed to be candy cane but it smelled more berry to me. It is also a very light scent. I applied 3 coats with no base coat and 2 coats of HK Girl. Next time I will add a red base. Sunny has created an awesome collection for the Holiday season! I could not find a single thing that I didn't like about this collection. Amazing colors and perfect formula! If you are interested in purchasing these polishes or any others check out the store! love the green and gold!! They would look fantastic together!! It's so fun that these are scented!! These are so, so pretty! Trimming the Tree has got to be my favourite as well, but I like them all. I *love* a good glitterbomb, but these are so cute and understated. Really lovely!